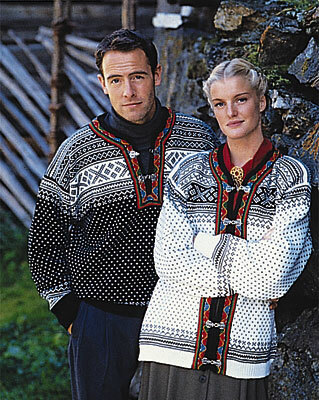 The Setesdal sweater origins from the Setesdal area in Southern Norway, and the general term for both the sweater and kofte (jacket) is ‘Lusekofte’. It is considered one of the world’s most knitted sweaters. ‘Lusekofta’ comes with pewter buttons on the sweater and clasps on the jacket, and a colorful embroidered trim around the neck. It is knit with a heavy-weight Norwegian yarn, and comes in two variations: Black main color or white main color. Originally, this design was created in Setesdalen valley at the beginning of the 1900s. Throughout the region’s numerous museums, you will find sweaters that are similar to this design, as the men used to wear them with their region’s national costumes. Setesdal is a traditional district, and the oldest Norse form of the name was Setr. This was later replaced by Setrsdalr (‘the dale/valley of Setr’). The common word setr has the meaning ‘homestead’ or ‘farm’. After the Lusekofte was discovered by tourists in the 1920s, it became very popular and today they are made in are many different patterns and colors. In 2001, Norwegian textile designer and writer Annemor Sundbø released a book about the history of the Setesdal sweater called Setesdal Sweaters, The History of the Norwegian Lice Pattern. She is considered one the foremost experts in knitting. Below is an extract from the book review translated by Amy Lightfoot. 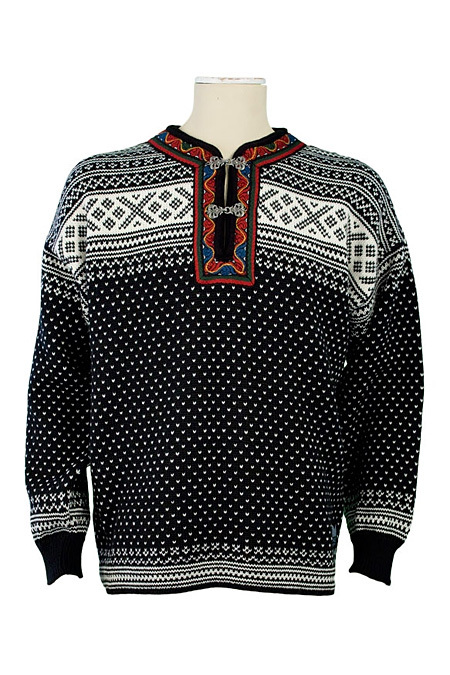 “Lusekofta”, the “lice” pattern sweater from Setesdal in Norway, features one of the world’s most knitted and varied sweater motifs. Setesdal Sweaters is the result of Annemor Sundbø’s research into the magic of the “Setesdalskofte.” In this colourful book, you’ll find old photographs as well as quotations from historical newspaper articles and descriptions from many people — an exciting cultural history incorporating faith, superstition, politics, and technical invention. This story of the lice-patterned sweater from Setesdal, combined with the earliest patterns for these famous sweaters, will give inspiration and ideas for creating a sweater the Setesdal way – from knitting the patterns to working the unique decorative embroidery that surrounds the collar and cuffs. The story begins with a tiny louse which has left indelible traces behind it. The “louse” is the smallest element in patterned knitting. It was captured and used in an undershirt in Setesdal one day around the middle of the 1800`s and was later so prolifically used that it has more descendants than any other pattern in knitting history. This is the story of the lice patterned sweater from Setesdal. Setesdal is north of Kristiansand, a long valley that follows the river Otra to Byglandsfiord, past a long inland lake, and continues along the river between narrow mountain passes and high ridges. 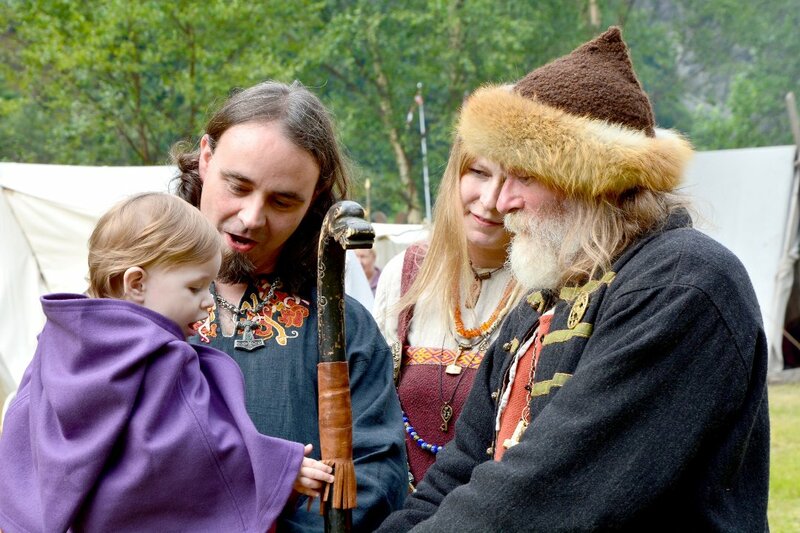 The valley is renowned for having maintained old- fashioned costumes and traditions longer than any other area in Norway. The history, combined with the earliest patterns for these famous sweaters, will give inspiration and ideas creating a sweater the Setesdal way, from knitting the patterns to working the unique decorative embroidery that surrounds the collar and cuffs. See knitting pattern here (Wikipedia). ‹ Help Us Name the Norwegian Mountain Range!